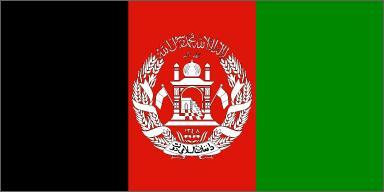 Afghanistan Government is an Islamic republic government. The current formal name is (The Islamic Republic of Afghanistan); To know the current Afghanistan government better, we need to review a few previous governments. The first government of Afghanistan after the Soviet invasion was the 2 months primary government ruled by Sibghatullah Mojadeddi. Then the government moved to Burhanuddin Rabbani. After a few months governance, fighting has started to intensify among rival factions. In reaction to the anarchy and warlordism prevalent in the country as well as lack of Pashtun representatives in the Kabul government, the Taliban movement emerged from the southern province of Kandahar with the support of Pakistan government. The Taliban took control of approximately 95% of the country almost until mid September of 2001. In 2001 and after the 9/11 attacks, the United States and its coalition allies launched an invasion of Afghanistan to oust the Taliban government. After weeks of bombardments by U.S air force on Taliban shelters, the Taliban have escaped to the southern provinces. On December 2001, the UN Sponsored Bonn conference was held in Germany and Afghan factions met. As a resault, Hamid Karzai, a Pashtun from Kandahar was chosen as chairman of transitional administration of Afghanistan. After governing for 6 months, former King Zahir Shah convened a Loya Jirga, which elected Karzai as president and gave him authority to govern for two more years from June 2002 to October 2004. In 2003 the constitution of Afghanistan was made and approved by Loya Jirga (Grand Assambly) as the official law of Afghanistan. On October 9, 2004, presidential election took place and Karzai was elected as the president of Afghanistan in the country's first ever presidential election. 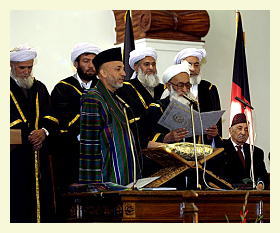 In 2004 the Afghanistan national anthem, was adopted in Pashto language and it was approved by Hamid Karzai in 2006. Since 2004 up to now Hamid Karzai is the President of Islamic Republic of Afghanistan with 25 ministers and one senior minister in the cabinet. These ministers were nominated by President Karzai and approved by the Wolesi Jirga (House of People), and sworn in by the President. The current 25 Ministries and Ministers in the structure of the Afghanistan government. Also in Afghanistan government, there are 11 to 12 independent departments which were established to function within the executive branch of the government. Departments can propose acts and regulations for better management of their activities. Moreover, a number of commissions have been established in various fields within the structure of the Afghan government. Thses commissions are considered to be vital for the Afghanistan's overall development. In December 2001 Bonn Conference Germany, Hamid Karzai was selected as the Chairman of the Transitional Administration of Afghanistan. In the 2002 Loya Jirga (Grand Council) was held and Karzai was appointed as the Interim-president of the Afghan Transitional Administration. Then in 2004 presidential election, Karzai has been elected as the second term president of Afghanistan for five years and his second term presidency ended on August 2009. The Afghanistan presidential election was announced to be held on August 20th 2009. Many influential Afghans from inside and outside the country has registered themselves as candidates for the presidential election. There were forty candidates who run their campaigns for several weeks across the country. After weeks of campaign, two candidates remained for the final which were Hamid Karzai and Dr. Abdullah Abduallah. On August 20th 2009, the election was held between the two candidates in a challenging situation. The Taliban had announced that they will interrupt the election process as well as threatened the people for not going to the polling stations to vote. However, despite all the security issues, people have participated in the election process and used their ballets in order to elect their president. A week later, the international observers and the Afghan Election Commission have announced over six hundred cases of fraud ballots due to security issues and lack of enough observers in some provinces. On October,20,2009, the result of the election was announced after several weeks of investigation about the fraud and Hamid Karzai went to a runoff against his opponent Dr. Abdullah Abdullah. Karzai accepted his runoff due to pressure from the West and second term election was scheduled for November 7th 2009. Before the scheduled date of the presidential election between Karzai and his opponent, Dr. Abdullah Abdullah announced that he won’t participate in the election. As a result of the non-participation of Abdullah Abdullah, Hamid Karzai was announced as the president of Afghanistan. However, the 2009 election was one of the controversial elections in the history of Afghanistan; people are hopeful and optimist for the future of a free, peaceful Afghanistan. In recent years, the Afghan people and the international community have accused the Afghanistan government as a corrupt and a failling government.